Here is the deal; nobody ever loves working with a blunt knife. You do not have to be a professional chef to enjoy slicing, chopping or dicing with a razor-sharp knife. Even an ordinary amateur like me and you never really appreciate a dull blade in our kitchen accessories. Most knives are bought sharp but get blunt after a while. You, therefore, have to sharpen the blades regularly for easy slicing of meat. But what do you use? Traditional methods tend to be too time consuming and require certain skills to pull off. So what is the solution? Use an electric knife sharpener to hone the blades within seconds or minutes. They not only save time and keep you safe from the sharp edge but also shield the knives from damage by removing a consistent layer of metal. Choosing the best electric knife sharpener is what troubles most consumers as the market is rich in these devices. Making a choice, therefore, becomes a bit harder. In this buying guide, we will highlight all that you need to know about electric knife sharpeners. A knife is to some extent an extension of your hands. A sharp one projects your personality and cutlery skills. Since the invention of electric knife sharpeners, maintaining the sharp blades has been made easier. However, if you have not bought one, you might be still grappling weighing the potential pros and cons of owning one. These are some of what to expect when using one. Sharpening a knife manually or seeking a professional to do it takes some time. With an electric sharpener, all you do is plug it into the kitchen power outlet, draw the knife blade into the slots and then slowly drag the knife out. It’s as simple and quick as that. If your knife is not too blunt, then this takes just seconds. But if it had become too blunt, then you will have to pass it through the slots multiple times. In whichever case, it still saves you valuable time. Operating an electric knife sharpener requires no special skills to perform. Provided that you know how to use the knife, determine when it is sharp enough and switch the device on, you are good to go. The same cannot be said of the manual sharpeners which need balancing of the blade. If you usually take your knives to a professional for sharpening, then owning an electric sharpener will be cheaper in the long run. Although the initial cost of a sharpener is high, it won’t be as much as the cumulative total you would pay a professional. There are certain expensive knives which require extreme care when sharpening. 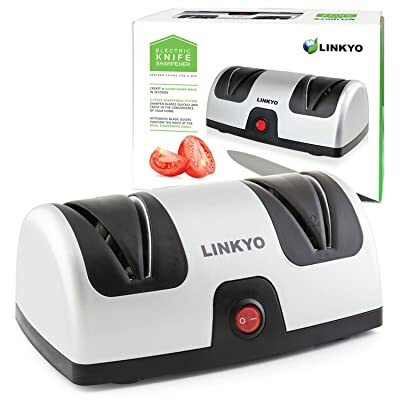 This care is provided to a great effect by the best electric knife sharpener by removing a consistent amount of metal on either side of the blade. When using a manual sharpener, it becomes hard to sharpen both sides at the same time. Such a maneuver may damage a delicate knife. Using an electric sharpener needs you to hold the knife at the handle and drag it through the slots. The device automatically does all the sharpening work for you. It’s unlike some manual models which require you sometimes to hold the blade when sharpening. Any slip could lead to a cut from the sharp blade. There exists an array of manual knife sharpeners and sharpening stones as well. However, none of these can be used to sharpen all the types of knives in your collection. I don’t think there is a sharpening stone you can use for both serrated and kitchen knives. With an electric knife sharpener, you can be sure to hone most of your knives. It could be different blade materials and design; it does all these. Electric knife sharpeners do not come cheap. More so, if you are looking for the high-end options ones with multiple slots for sharpening, polishing, steeling and stropping. These will easily cost you upwards of $100. If you do not take care, the sharpener could damage your knife. It is imperative you firmly hold the knife and avoid over pressing it down while passing it through a slot. Doing so could lead to an overgrind and scratches on the blade. Some electric knife sharpeners are not as compact as the manual ones. They, in turn, occupy more space on your kitchen tables. Some are also bulky and big. Although they have a fair share of disadvantages, the pros out rightly outweigh these cons. When in need of a razor shape knife, you need a sharpener that is quick, efficient and keeps you from cutting your fingers. They are, therefore, a worthy investment for you if you are a knife person. To assist you in settling on the right sharpener for your kitchen needs, I have rounded up some of the things you need to consider before buying one. A typical electric sharpener consists of 2 stages for sharpening a knife. The first stage is mostly for pre-sharpening the knife, while the second one is to polish and hone the knife blade. Each of these stages has a wheel for performing the specific functions. In some cases, you can get a sharpener with extra stages, making them 3 or 4 in total. These added stages are meant to give the blade a razor-sharp edge or might be another angled slot. There are some options with a single stage, but you need to be wary of these. Their course wheels remove unnecessarily more metal at once, thereby shortening your knives’ life span. However, if you want to sharpen a pocket or a utility knife, then the single stage sharpeners will do for you. A knife blade has 2 sides that need to be sharpened to a certain uniform degree. To enable this functionality, electric sharpeners come with 2 slots on each of the wheels. This design makes it easier to sharpen both sides by turning the blade from left to right and not the device. These slots provide for the sharpening of a blade to a specific angle depending on your knife type. For a European or an American knife, the angle should be honed to about 150. Knives vary in these regards though, but you always want slots which can deliver you the desired sharpness angles. Even experienced knife sharpeners still need a device with an angle guide so that they can attain the previously mentioned angles. The guide is also meant to make sharpening a lot easier, more accurate and done faster. Always look for a machine with an angle guide on it. In any electric knife sharpener, it is the abrasive material which is responsible for doing the sharpening work. The components used in making the abrasive material to an extent affect the precision of the sharpening. It could also determine the suitability of a quick touch sharpening or an in-depth re-sharpening. In this regard, there are wheels made from titanium, tungsten carbide, ceramic or diamond. Of these, diamond abrasives are the best for honing the sharpest edges. Because of the unique property of diamond of not getting too hot when sharpening, knives are unlikely to be damaged in the process. A sharper, more durable edge is created in the process. When shopping for a perfect electric sharpener, it is good to determine first the types of knives you will need to sharpen. Are they straight or serrated edges? What materials are the blades made from? You need to ask yourself these questions first, and then look for the most suitable sharpener. Ordinarily, you would want a device that will handle most of the knives you have. Be it a carbon, stainless steel or an alloy blade; it should be versatile enough to do both. There are high end options which will be able to sharpen even serrated blades. Electric sharpeners are known to have considerable weight due to the presence of the motor, sharpening wheels and the metals used in their construction. In whichever case, you need a device that you can easily move around. Another issue is whether to go for a battery powered or one that is plugged in. A battery operated one allows you to use it on the go, but are less powerful. A good compromise would be to buy one that uses both batteries and can be plugged in. The size plays a key role too. It should neither be too big to compromise on portability, nor too small to compromise on the functionality. With all the moving parts and a sharp knife, your safety should be of utmost importance. The device designs should be such that there is reduced risk of injuries while being used. Features such as non-slip rubberized feet or rubber-grip handle all work to this effect. The rubber feet are a must to prevent the machine from moving about when in use. The handle is not common, but you can look for one, just to be sure. After you have completed your work, you need to clean the entire metal residue left behind. Various designs use different cleaning methods, but should always get the job done. There are options which require the use of a magnet for cleaning, but this process is tiresome. Alternatively look for one with a removable residue tray or with a magnet fused in the tray. It makes for the easiest cleaning processes. The work sharp knife sharpener is a device that ticks in the right boxes for beginner and specialist knife sharpeners alike. It is designed to sharpen almost all kinds of knives you may own, while still being easy to operate. Hunting, tactical, kitchen, filet, pocket and outdoor knives are just a tip of the knives you can sharpen with this tool. In addition, you can also repair and sharpen ceramic blades using diamond belts. 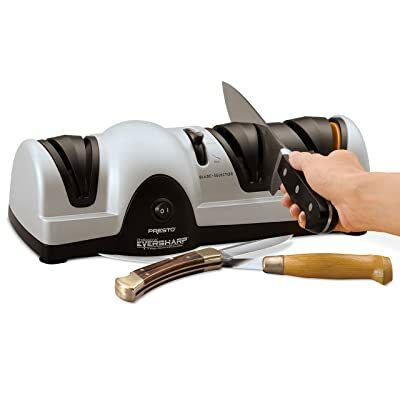 The inclusion of multiple premium belts enables the versatility of this knife sharpener. It has coarse, medium and fine belts, all to serve different purposes. To repair damaged blades or sharpen cutting tools, use the coarse belt. The medium belt is for a generalized knife sharpening while the fine belt is for honing, sharpening serration or quick touch ups of blades. Another feature that is great about this device is its precision guides. These are great as they enable faster, consistent and repeatable results. For sharpening kitchen knives and precision blades, use the 400 guides. The 500 guide is for hunting and other outdoor knives, while the 600 one is for household scissors. 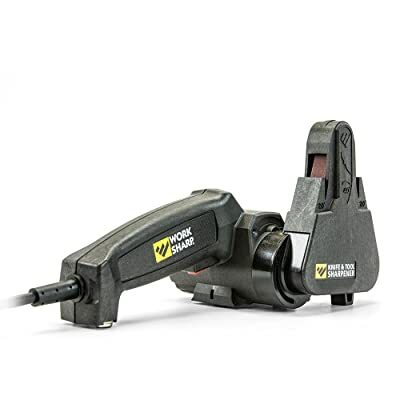 If you are looking for a 2-stage electric sharpener which still delivers a razor-sharp blade, then this product is a great option. The reduced number of stages simplifies the sharpening process of most of your straight edge and non-serrated bladed knives. I find the simplicity of this design quite appealing as you don’t have to fumble with complicated processes. You are provided with precision blade guides for added convenience. They are great additions because the guides position the blade at the ideal sharpening angle, hence delivering a consistent cut every time. Sapphirite sharpening wheels are responsible for the creation of a razor-sharp edge in just a matter of seconds. This abrasive material is quite common in some professional knife sharpening shops. The material remains relatively cool during the sharpening process hence preventing any heat damage to the knife. The inclusion of precision guides serves to eliminate guesswork from the sharpening process. Of the two stages, the first stage is for precision grinding of the dull blade. It is where an angled edge is precisely created. After this, the second stage is for honing and polishing of the angled blade for a finer sharp finish. For professional-grade sharp knives, then this product is a good option for you. The sharpening angle is set to be 150, meaning that you can use it to work on single bevel 150 and double bevel class of knives. But if you have the 200 class of knives, then you can use this electric sharpener to convert them to the 150 class. A better cut and long-lasting sharpness results in the process. A 3-stage sharpening process ensures that not too much material is removed from the knife’s blade in the course of the sharpening process. It, therefore, increases the life span of your knives, while keeping them sharp. The first and second stages of the process use abrasives made of diamond, with the third stage making use of an abrasive stropping disk that’s flexible. Its initial stages are meant to create the precise angle; then the last stage is for smoothening of the sharp edge produced. Additionally, the stropping disk in the third stage enables the sharpening of serrated knives. What this means is that your bread knives will no longer have to stay blunt. For those with American, European or Asian styled knives, either straight or serrated edge, this sharpener will definitely work for you. 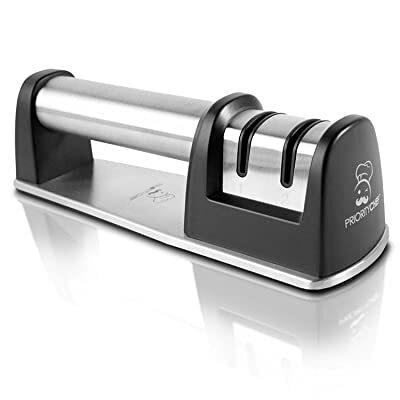 Featuring a classic electric sharpener design, this Presto sharpener is one of the best electric knife sharpeners currently in the market. Sometimes you might mistake its affordability for poor quality. However, that’s not always the case as it performs considerably well. Similar to the previous electric option, this particular one also has a 3-stage sharpening process. It is a feature that makes sharpening of very blunt or damaged knives an easy task. The first stage is where the process starts with the creation of the appropriate work angle. A coarse Sapphirite grinding wheel is used for this step. Stage two uses a medium Sapphirite grinding wheel to give the blade a precise edge. Lastly, stage three comprises of an extra fine grit ceramic wheel for polishing the blade to a razor-sharp state. Sharpening of knives at different angles is made possible by the inclusion of an interchangeable guide for the blades. The best electric knife sharpener should be made from high quality materials, be reliable and sharpen both serrated and straight edge knives. This sharpener certainly performs in these regards. Its unique design also makes for quite an interesting kitchen accessory to consider having. Perhaps the unique feature that is not common among these products is the ergonomic and comfortable handle. It is meant to give you an assured hold of the machine so that it does not move about. But I don’t think you might need it often. In addition to the easy grip handle, the rubberized cushion is provided at the bottom for stability. A two-stage sharpening mechanism might not seem as fancy as a three stage one, but the one on this device works just as effectively. It’s comfortable to use and gradually makes the blade razor sharp in just two steps. This mechanism is easy to use and requires that you position your dull knife on the sharpening slot and gently drag it out. 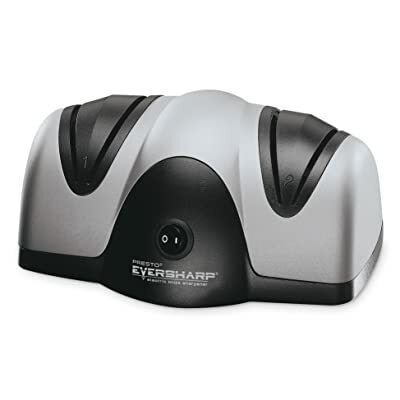 This sharpener can efficiently sharpen all types of knives, including the high quality and hard steel blade ones. 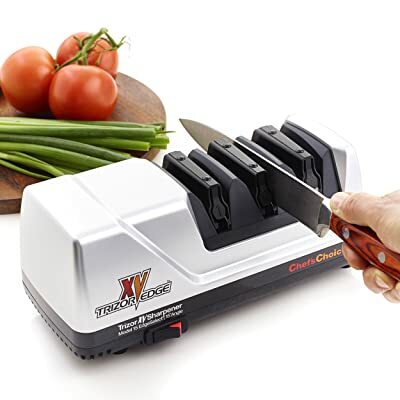 If you have been keeping old and dull knives because you lack a better sharpening option, then this product gives you a way of bringing them back to life. This is another sharpener that will make life simpler for you. The problem most knife sharpeners have is a certain degree of difficulty in cleaning the mess thereafter. However, this product makes this task of cleaning the mess easier than conventional types. There are mess-free receptacles that include easy to remove plugs. The plugs catch the metal fillings and shards, and can then be removed and cleaned after you are done. The LINYO features a 2-steps sharpening mechanism, where stage one angles and reshapes your dull knife, and then stage two polishes and hones the already sharpened blade. As a result of this, you end up with a razor-sharp and rejuvenated knife blade. Your safety is provided for by the inclusion of an automatic blade guide that positions and guides the knife through the slots. In addition, a non-slip suction cup firmly keeps the device still when being used. A sharp knife is exactly what you need when preparing meals that involve cutting, slicing or chopping. A blunt one requires too much effort, plus it may chop your finger if you put too much pressure on it. Homeowners, chefs and professionals alike require an electric knife sharpener to get dull knives back to shape quickly. Most importantly would be when you operate a high-volume sharpening task. The best electric knife sharpener would come in handy. I hope this buying guide has been insightful as you shop for an electric knife sharpener. In the reviews, my favorite choice would be the Work Sharp Knife & Tool Sharpener. It is fast, comes with multiple blades for sharpening different knives and tools and has precision guides for determining the sharpening angles. This is a great review on electric knife, thanks for your very useful post I am glad to bookmark it right now.